In this article I will look at change and tradition within Arabic secular dance music of Egypt and Lebanon, some theories of the transmission of change, and some of the artists that embody the “old school”, and some that are included in the “new school”. Within the secular music of this region, what is considered Arabic classical music, and what is considered Arabic popular music? Is there a pure form of classical music within the Arabic genre? What are some of the factors of change that have influenced Arabic secular music? These are some of the questions I wish to address in my paper, as well as look specifically at the dance music of the ‘40’s and how it has influenced the dance music of today. Written in 2001. I would first like to take a look at the Arabic musical sound, and what distinguishes it from other musical genres. The instruments themselves are unique to this area of the world, as well as the melody line and the notes contained within the note range or “maqam”, and the rhythms are all as unique to this area of the world as is the Arabic language. In the “takht” ensemble, or traditional Arabic small musical ensemble (literal translation from Farsi, “raised platform”) the qanun, or trapezoidal plucked zither, is the main melody instrument doubling the solo vocalist’s rendition of the “lahn” (skeletal melodic framework), as well as providing “tarjamah” (literally meaning, translation) of the solo vocalist’s melodic line, and the leader of the ensemble (El-Shawan, 1984, p 273). The qanun player also mediated between the solo vocalist and the rest of the ensemble and was responsible for the accurate tuning of instruments, as well as timbre (ibid). In some cases, as I have seen at Manhattan’s Cedar’s of Lebanon restaurant, the oud (fretless short-necked lute) player doubles as the leader of the band and main singer in the absence of both a qanun player and a solo singer. In the diaspora communities of America I would say that the former is more the case than the latter, as quality qanun players are a rare commodity. The famous singer Farid El Atrache is an exception; as he was an oud player, main solo singer, as well as composer from Lebanon made famous in Cairo. The leader of the rhythm section in the takht is the riqq (round 10 “ framedrum with jingles) player, or “dabit al-iqa”, “rhythmkeeper” (Racy, 1988, p 144). I find it ironic that this musician has so much responsibility, yet receives the least amount of acclaim. It would seem that the darabuka player would be the main rhythm keeper, but in traditional takht ensembles the darabuka is absent; it did not make a formal entry until the advent of the “firqah” style ensemble, as we will discuss later. Other instruments in the takht are: ney (end-blown cane flute with seven holes), and kemencheh (spike fiddle). The violin was also used in the takht, and did much of the tarjamah, because the violin mimics the human voice so well. Once again, we do not see the advent of more instruments until the firqah begins to replace the popularity of the takht in the 1930’s and 40’s. The vocal section had a lead singer, as well as a chorus with a leader. The following terms define the chorus’ functions: “sannidah” (supporters); “tabbi’ah”(followers); “muradidin”(repeaters); “madhhabjiyyah”(repeaters of the refrain); and “bitanah”(lining) (El-Shawan, 1984, p 274). The chorus usually consisted of four or five male, sometimes female, vocalists. The lead singer could be male or female. Performance places for the takht were home of wealthy patrons where tents were set up outside to accommodate large crowds, cafes, and large theatres (ibid). The maqam, or modal scales, of Arabic music provide the framework within which the melody presents itself. There are different maqams for each Arabic country, as well as the Persian dastgah, the Turkish maqam, and even the Uzbeks have their own version of the maqam (Shiloah, 1995, p 113). Rather than the typical five-note Western scale, the Arabic maqamat encompasses seven notes, with quarter tones in between. A musician’s virtuosity is displayed in their ability of playing within a certain maqam during their improvisation, or “taqsim”, then modulating to a different one, and descending back down to the original point of departure on the scale; a performance without any modulations is not considered wholly artistic in nature (Arabic Classical Music, 2/20/01). Maqams were also prescribed as a sort of music therapy for healing of a patient by the sheikh of a Sufi order, particularly in ancient Turkish traditions, such as the Mevlevi Order of Konya (Bolat, personal interview, 1997). For instance, the maqam “hijaz” is seen as beneficial for inducing a state of sensuality; the maqam “nihavend” is good for inducing humility, and the maqam “ussak” is good for giving one an expansive perspective (ibid). Rhythms, or “iqa”, are another factor that define Arabic music in a distinctive way in that they are monophonic, and not polyphonic (Arab Music, Part II, 2/19/01). Arabic rhythms are split into “dums”, “teks”, and “tekkas”, the bass and treble beats, respectively. Most Arabic rhythms are in an even 10/8, 6/8, 8/4, 4/4 or 2/4 beat patterns, although the accent is placed differently with each one; 10/8, or “sema-i”, however, is only seen in Arabic classical music (ibid, p 123). An example of this is seen in the most typical of Arabic rhythms, “baladi”, or “beledy”, translated literally, “country”, or the common rhythm of the people of the country. It goes: dum-dum-tek-dum-tek, as the basic version, or with added teks for embellishment, dum-dum-tekka-tekka-dum-tekka-tek, with the accent on the second dum in each version. The uneven rhythm of 9/8 is mainly seen in Turkey and is called “karsilama” and employed mainly by the Romani or “gypsies” of Sulukele in Istanbul, and also by Armenians; 7/8 is mainly seen in the province of Khorasan in Iran, as well as Afghanistan, Tajik, and Uzbekistan. It is interesting to note that although Armenians employ the 10/8 rhythm it is not indigenous to their music; it was picked up by their time spent in now modern-day Iraq perhaps by mixing with the Kurds when the Armenians had to move from their homeland when the Turks displaced them (Bilezikjian, personal interview, 1997). A unique quality of Arabic music is that the ensemble will play together on the melody all at the same time, called “heterophony”, but each musician will create his own nuances and ornaments, which produces individualized musical interpretations (Racy, 1988, p 144). To break up the monotony each instrument may choose to take a solo on the melody, similar to jazz music, but is not considered a taqsim. A taqsim is a separate part of the music, usually seen at the beginning of a melody, or placed in-between melodies as a sort of bridge. A taqsim can also be considered an entire composition unto itself without the need for a melody. The term taqsim literally means “division”, as there is a high degree of sectionalization that characterizes the form (Shiloah, p 127). “The taqsim is divided into a chain of sections, the number, shape and length of which depend largely on the musician’s individual abilities, state of mind and, to some extent, the circumstances surrounding the performance. The sections may be delineated by rests or by concluding contours similar to cadences in the sense of typical melodic flow toward the finalis with which a musical section ends. The cadences appear several times in the sections of the taqsim” (ibid). The vocal equivalents of the taqsim are the “layali” and the “mawwal”. In the layali the words repeated are, “ya layali!” or “O my night!”, and “ya ‘eini!” or “O my eye!”. The singer uses these words are the phonetic base for his/her improvisations accompanied by the oud or some other melodic instrument meant to keep the singer in pitch, to reinforce important tones (or drones), and also to play in-between the singers breaks (ibid, p 129). The “mawwal” falls between the layali and subsequent metrical rhythmic forms; it is usually improvised on a strophe of varying length, which belongs to a genre of folk poem also called mawwal (ibid). The rhythmic portion of the mawwal is free-form, however. A typical takht performance would be as follows: one to three “waslat”- a suite of vocal and instrumental compositions and improvisations in the same maqam. The main feature of the waslat was its final composition: a large-scale vocal form such as the “dawr” or “qasidah”. “This climactic work was preceded by several small-scale vocal and instrumental compositions alternated with improvisation which served the dual purpose of establishing the maqam of the waslah and preparing the solo vocalist for the culmination of the performance. Each waslah lasted anywhere between one-half hour, and one-and-a-half hours” (El-Shawan, p 274). At this point I feel it is important to stress the difference between secular and sacred music. Secular music is the music of the people, the music that is played at weddings, parties, and in public places usually for entertainment. Sacred music is played for religious purposes only in the Middle East. Both the takht and the firqah are solely secular, however some of the main musicians and singers have backgrounds in sacred music, such as Umm Kulthum, which enabled them to become better artists. I believe the most important distinguishing feature of Arab music in both the secular and sacred music genres is the concept of “tarab” or “enchantment”; it is the one element that Arab people look for as a criterion for quality, and what non-Arabs notice immediately without dissecting the musical form. Tarab can be seen in the musicians and the listeners by particular facial expressions, body and head movements that denote a state of trance (Racy, 1982, p 392). Those present at the musical event when tarab is achieved can hear exclamatory expressions such as “Y’Allah” or “Aiwah!”, or a “zaghareet” may be sounded, a ululation usually made by women. The above mentioned improvisational styles basic function is to produce the feeling of tarab, and it is also the factor in sacred music that produces the state of trance that leads to healing. For the musician or singer to achieve tarab they must also have “saltanah”, or the understanding of a certain maqam. “A singer would perform best in a specific maqam only after he develops the ‘saltanah’ of that maqam” (ibid). Having this quality leads the listeners and the performers onto a mental state of deep musical involvement, and is usually only achieved after the performer has been in the maqam for at least two minutes, which gives rise to the reason Arabic musical performances of one song can last over an hour long. My personal opinion is that in the ancient Middle Eastern world music was solely used for healing purposes, and that over time it came to be used for entertainment; perhaps that is why music for entertainment purposes is seen as “haram” or “forbidden” by Islam. Ignorance of how a certain music will affect others moods can cause great harm. It could be a pre-Islamic value that carried over into Islam. Perhaps because of the transgressive nature of tarab, and because being a musician is not considered an educated job in the Middle East the social position of performers is quite low. However, these musicians are seen as fulfilling a social service; enchantment is seen as something that was a necessity to society. The singer was called “mutrib”, or “one who enchants”, hence he/she being higher up in the musical hierarchy than the instrumentalists. The musicians were even banded together in the takht as a sort of laborers guild; they functioned much the same way as other working guilds. As there is division between secular and sacred music in the Arab world, so is there a division between country and art music, as in other parts of the world. Country music as mentioned above is called “beledy”, and art music mainly originated in the various royal courts throughout the ancient Middle East, in such dynasties as the Fatimids in the Arab world, the Safavid and Qajar in the Persian world; Suleiman the Magnificent, perhaps the greatest leader in the Ottoman dynasty, had a great deal to do with the sophisticated music of his era (ibid, p 88). The Mughul dynasty in present day Rajasthan also played a large role in refining music of the No. Indian subcontinent. While there is a difference between country and court music, it is important to note that the musicians that played at the royal courts were certainly not royalty; they came from the peasants of the respective areas, and traveling bands of “gypsies” that came out of Rajasthan and migrated to different part of the Middle East. These same gypsies became known as Romani in Turkey, and Nawal in Egypt (ibid, p 100). It is interesting to note, however, that in India and Iran there is a codified classical form that sprang from the entertainment of the royal courts; in the Arab world there has been no codified classical form until very recently, and it is still in the state of formation. The secular music we will be concerned with in this paper is the popular music that is largely distributed by recordings throughout the Middle East and the diaspora communities throughout the world. It is largely considered art music, but has many origins in the country and sacred music of the respective regions. Therefore, it is difficult to label popular music in the Arab world. It is not purely country or art music, and neither solely popular or classical; all genres seem to melt together. Arabs often use the term “lawn khass”, or “special color” to differentiate the aesthetic criterion of a particular music (Racy, 1982, p 400). “The most enviable artist is usually someone who satisfies aspects of tradition, creativity, and innovation, and also develops his own “lawn khass””(ibid). Tradition in the Arab music world must have a quality called “ruh Sharqiyyah” or “eastern spirit”. Creativity results from the complex musical workmanship of the artist. Innovation is seen in the novelty of the composition as juxtaposed and incorporating works from the 19th century to present day. Individuality can be seen in distinguishing musical traits such as vocal timbre, or a specific genre or musical style (ibid, p 391). The Arabic word “tatwir” means “developing” or “making evolve”. A funny play on words as stated by Dr. Jihad Racy is that tatwir should not become “tatyir”, or “to make fly” or “dissipate” (Racy, 1982, 395). An artist should still have the inherent traditions intact in his music, and not add too much innovation, lest the composition should lack in ruh Sharqiyyah. So far in this paper we have discussed Traditional Arabic Music (TAM); regardless of it is a fusion of different Middle Eastern styles, the takht is an Arab phenomenon without any Western influences. I would now like to take a look at the advent of the “firqah”, or literally, “group”, or “orchestra” that became popular in the 1930’s and 40’s in Cairo, but started as early as 1910. Basically, a firqah is an enlarged takht; there was much controversy over the changes made to the takht, but these were gradually incorporated as permanent features of TAM (El-Shawan, p 274). The height of the firqah’s popularity was during the “Golden Era” of TAM in the 1940’s. The size of the firqah ranged from six to thirty instruments; most instruments were doubled, except the riqq, and new instruments were added. Most of the expansion took place in the violin section; by 1960 as many as fifteen violins were being employed in the firqah (ibid, p 275). Some of the new instruments that were added were: one or two cellos; double bass; flute; accordion; and the tablah, or dumbek (goblet-shaped drum). The solo vocalist continued to be the main focus of the firqah, as seen in the case of Umm Kulthum. Contrary to the takht, all instruments doubled the vocalists’ rendition of the lahn. The chorus was much the same as in the takht, but could expand its numbers depending on the performance. The performance venues for the firqah no longer included private homes of patrons, as the crowd size grew along with the musicians’ numbers; cafes, as well, no longer were larger enough to hold the audience size. Large auditoriums were the norm for the firqah performances. Private parties could hire a firqah, however, thus limiting the size of the audience (ibid, p 276). While the recording industry held sway during the era of the takht, the radio and song-films became the vehicle for dissemination for the firqah (ibid). The famous radio broadcasts of Umm Kulthum, and the Cairo films of Mohammed Abdel Wahab and Farid El Atrache are a testament to their popularity as the norm for popular musical entertainment. In contrast to the takht, the firqah performance had an abbreviated then eliminated waslah during the 1930’s. Audience participation was still strong, however. “The ‘abbreviated’ waslah contained two to four compositions and improvisations; for example: an introductory instrumental composition, followed by one or several taqsim, a layali and mawwal, and a large-scale vocal composition such as a munuluj or a qasidah. In some cases, performances consisted of one of two large-scale vocal compositions alternated with vocal and instrumental improvisation” (ibid). Now I would like to differentiate between what is considered classical Arabic music and what is considered popular Arabic music. The term “al-turath” refers to TAM, and incorporates both the takht and the firqah of the 1930’s and 40’s. I would call “al-turath” the classical Arabic music, for as it is traditional it is still art music, and not the country music of the people. In contrast is the term “al-jadid”, which refers to Arabic music that is deliberately and consciously open to non-traditional influences especially outside of Arabic music (ibid, p 272). In the 1930’s and 40’s the music of Umm Kulthum and Mohammed Abdal Wahab were considered new and innovative, and not al-turath. Possibly this is because the firqah was then a new concept, and only the takht was considered al-turath. However, with the passage of time and juxtaposing the music of Cairo’s Golden Era of the 1940’s with today’s al-jadid, the firqah is now considered traditional. The passage of time and new outside influences has made the TAM encompass much more stylistically. In 1967 a new kind of ensemble was formed to replace the existing firqah style ensemble. It was named Firqat al-Musiqa al-Arabiyyah, and was formed to compete for funds against the new Western style classical orchestras that were budding in Cairo. Radical changes were made to several features of TAM, so much so that I think it could hardly be called al-turath. The solo vocalist, which had long been a staple of TAM, was removed and replaced with a large chorus of men and women. The conductor was established as the leader and focal point of the ensemble, rather than the qanun player, and western notation was employed by all involved in FMA (ibid, p 276). The firqah was maintained, but western instruments, except the violin family, were banished from the orchestra. The most shocking trait, I believe, that was changed was the elimination of improvisation for instrumentalists, and musical compositions were the same in every performance. The effect of tarab is what I see as the heart of Arabic music, and to think of it not existing in a composition simply makes it not Arabic. The rationalization is that with such a large ensemble including a chorus, improvisation on the melody was not possible. Performance only takes place in concert halls, and Western norms of audience responses are observed; the usual Arabic exclamations are shunned, and really are not necessary as no tarab is achieved in the performance. Also, printed programs are passed out as at Western classical performances, and are strictly adhered to (ibid, p 277). The cultural policy of the 1952 revolution provided the impetus to preserve TAM and Egypt’s cultural heritage. In the early 1960’s meetings were held to discuss the future of TAM; amongst the arbitrators were Mohammed Abdal Wahab, and Umm Kulthum. 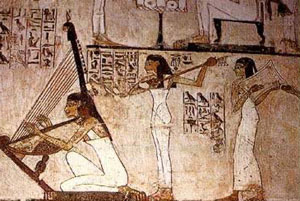 There was little support for TAM by the Ministry of Culture of Egypt with preference given to the Cairo Symphony Orchestra for funding. I find it ironic that Umm Kulthum was chosen as the spokesperson for the musicians of Cairo, when once the alternative orchestra was formed five years later, the lead singer’s position was eliminated. However, she had goals: 1) for the survival of TAM, which she had performed earlier in her career; and 2) the equitable distribution of public funds between Western music and TAM institutions (ibid). So, the advent of FMA was a compromise between TAM and the Western symphony orchestra in the attempts to not leave Egypt’s musical heritage behind. Despite its radical changes to TAM, the immense popularity of FMA attests to its success; without public appreciation it would have never survived. FMA paved the way for a new classical Arabic genre in the roots of al-turath; by eliminating the singer they inherently delegated that role to the al-jadid, or popular music. Truly, the best of the popular singers today are not in the classical genre; they mainly come from Lebanon, a few from Egypt. The best classical orchestras come from Egypt, as was the purpose of the Ministry of Culture when they developed FMA. As stated by one committee member concerning the lack of lead vocalists in FMA, “there are no good voices any longer who are capable of performing TAM in the old way, and we have to distinguish ourselves from popular music” (ibid). The initial makeup of the FMA’s orchestration was basically an expanded takht with a conductor and a chorus; instruments were: 2 qanuns, 10 violins, 2 uds, 2 nays, 1 riqq, 10 male, and 10 female vocalists. A year after its founding 2 cellos, and a double bass were added (ibid, p 279). Instrumentalists held a key role in the performance, even with the absence of improvisation; they did mainly compositions, introductions, and interludes of vocal compositions, as well as double the chorus and vocal soloists, duos and trios of the chorus throughout the performance. However, tarjamah was eliminated because it was considered to make the lahn impure (ibid). It is interesting to note that the only instrument allowed to improvise were the percussionists. The reasoning behind this phenomenon was to “add life and variety to the basic melody (lahn) which since ridded of ornamentation and improvisation can, at times, sound monotonous” (ibid, p 281). A typical performance of FMA would be as follows: two sets of seven to eleven vocal and instrumental compositions in one or two related maqamat. After each composition there is a brief pause, as in a Western symphony performance, where the audience is allowed to applaud. Each set lasts 45-75 minutes long and is mostly vocal compositions. A dawr or qasidah is always found at the end or some other longer vocal composition. Also, three to six small-scale vocal compositions, usually the muwashshah and the taqtuqah are in each set. Two instrumental compositions and a taqsim are also in each set. The instrumental composition always begins the set and precedes it’s final large-scale vocal composition; the taqsim is usually in the middle of the set (ibid, p 282). The main audience member at the FMA performances come from the young educated elite, contrary to the expectations of the founders. Most of them are city dwellers either from Cairo or from other Egyptian cities. Salaries of those who participated in El-Shawan’s survey were comparable to that of a high-ranking government official. There was only one Firqat that was designed for the working-class, the Firqat Al-Thaqafah Al-Jamahiriyyah; their performances are free of charge and take place in one of the government-owned “palaces of culture” which are located in the working-class neighborhood of “al-ghuri” (ibid, p 282-3). *Extended concerts, can last up to 1 ½ hrs. Since solo singers were no longer included in the new FMA’s classical music genre, they created their own genre of pop music. El-Shawan, Salwa. “Traditional Arab Music Ensembles in Egypt since 1967: The Continuity of Tradition within a Contemporary Framework”, Ethnomusicology, Vol. 28, No. 2 (May, 1984), pp. 271-288.